The invention of the bipolar transistor in 1948 ushered in a revolution in electronics. Technical feats previously requiring relatively large, mechanically fragile, power-hungry vacuum tubes were suddenly achievable with tiny, mechanically rugged, power-thrifty specks of crystalline silicon. This revolution made possible the design and manufacture of lightweight, inexpensive electronic devices that we now take for granted. Understanding how transistors function is of paramount importance to anyone interested in understanding modern electronics. My intent here is to focus as exclusively as possible on the practical function and application of bipolar transistors, rather than to explore the quantum world of semiconductor theory. Discussions of holes and electrons are better left to another chapter in my opinion. Here I want to explore how to use these components, not analyze their intimate internal details. I don't mean to downplay the importance of understanding semiconductor physics, but sometimes an intense focus on solid-state physics detracts from understanding these devices' functions on a component level. In taking this approach, however, I assume that the reader possesses a certain minimum knowledge of semiconductors: the difference between "P" and "N" doped semiconductors, the functional characteristics of a PN (diode) junction, and the meanings of the terms "reverse biased" and "forward biased." If these concepts are unclear to you, it is best to refer to earlier chapters in this book before proceeding with this one. 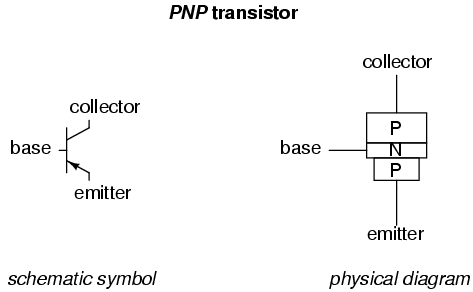 The only functional difference between a PNP transistor and an NPN transistor is the proper biasing (polarity) of the junctions when operating. For any given state of operation, the current directions and voltage polarities for each type of transistor are exactly opposite each other. 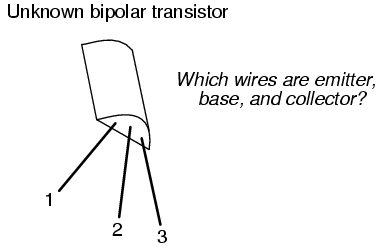 Bipolar transistors are called bipolar because the main flow of electrons through them takes place in two types of semiconductor material: P and N, as the main current goes from emitter to collector (or vice versa). In other words, two types of charge carriers -- electrons and holes -- comprise this main current through the transistor. As you can see, the controlling current and the controlled current always mesh together through the emitter wire, and their electrons always flow against the direction of the transistor's arrow. This is the first and foremost rule in the use of transistors: all currents must be going in the proper directions for the device to work as a current regulator. The small, controlling current is usually referred to simply as the base current because it is the only current that goes through the base wire of the transistor. Conversely, the large, controlled current is referred to as the collector current because it is the only current that goes through the collector wire. The emitter current is the sum of the base and collector currents, in compliance with Kirchhoff's Current Law. If there is no current through the base of the transistor, it shuts off like an open switch and prevents current through the collector. 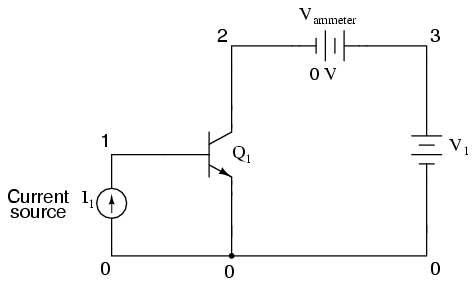 If there is a base current, then the transistor turns on like a closed switch and allows a proportional amount of current through the collector. Collector current is primarily limited by the base current, regardless of the amount of voltage available to push it. The next section will explore in more detail the use of bipolar transistors as switching elements. Bipolar transistors are so named because the controlled current must go through two types of semiconductor material: P and N. The current consists of both electron and hole flow, in different parts of the transistor. Bipolar transistors consist of either a P-N-P or an N-P-N semiconductor "sandwich" structure. 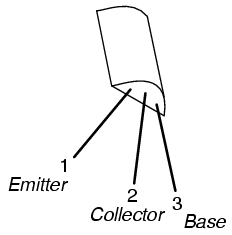 The three leads of a bipolar transistor are called the Emitter, Base, and Collector. Transistors function as current regulators by allowing a small current to control a larger current. The amount of current allowed between collector and emitter is primarily determined by the amount of current moving between base and emitter. 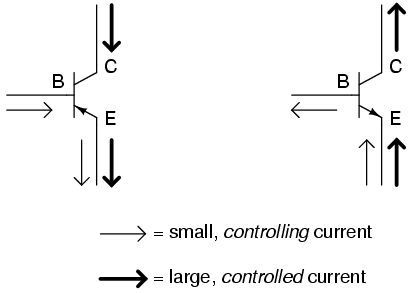 In order for a transistor to properly function as a current regulator, the controlling (base) current and the controlled (collector) currents must be going in the proper directions: meshing additively at the emitter and going against the emitter arrow symbol. Here I'm assuming the use of a multimeter with only a single continuity range (resistance) function to check the PN junctions. Some multimeters are equipped with two separate continuity check functions: resistance and "diode check," each with its own purpose. If your meter has a designated "diode check" function, use that rather than the "resistance" range, and the meter will display the actual forward voltage of the PN junction and not just whether or not it conducts current. Meter readings will be exactly opposite, of course, for an NPN transistor, with both PN junctions facing the other way. If a multimeter with a "diode check" function is used in this test, it will be found that the emitter-base junction possesses a slightly greater forward voltage drop than the collector-base junction. This forward voltage difference is due to the disparity in doping concentration between the emitter and collector regions of the transistor: the emitter is a much more heavily doped piece of semiconductor material than the collector, causing its junction with the base to produce a higher forward voltage drop. Knowing this, it becomes possible to determine which wire is which on an unmarked transistor. This is important because transistor packaging, unfortunately, is not standardized. All bipolar transistors have three wires, of course, but the positions of the three wires on the actual physical package are not arranged in any universal, standardized order. Meter touching wire 1 (+) and 2 (-): "OL"
Meter touching wire 1 (-) and 2 (+): "OL"
Meter touching wire 1 (-) and 3 (+): "OL"
Meter touching wire 2 (-) and 3 (+): "OL"
The only combinations of test points giving conducting meter readings are wires 1 and 3 (red test lead on 1 and black test lead on 3), and wires 2 and 3 (red test lead on 2 and black test lead on 3). These two readings must indicate forward biasing of the emitter-to-base junction (0.655 volts) and the collector-to-base junction (0.621 volts). Please note that the base wire in this example is not the middle lead of the transistor, as one might expect from the three-layer "sandwich" model of a bipolar transistor. This is quite often the case, and tends to confuse new students of electronics. The only way to be sure which lead is which is by a meter check, or by referencing the manufacturer's "data sheet" documentation on that particular part number of transistor. Knowing that a bipolar transistor behaves as two back-to-back diodes when tested with a conductivity meter is helpful for identifying an unknown transistor purely by meter readings. It is also helpful for a quick functional check of the transistor. If the technician were to measure continuity in any more than two or any less than two of the six test lead combinations, he or she would immediately know that the transistor was defective (or else that it wasn't a bipolar transistor but rather something else -- a distinct possibility if no part numbers can be referenced for sure identification!). 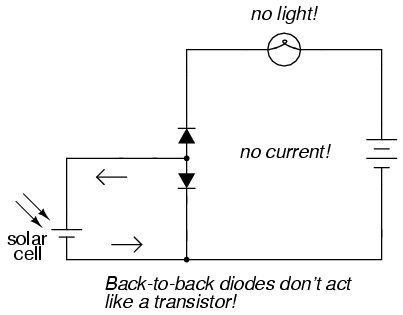 However, the "two diode" model of the transistor fails to explain how or why it acts as an amplifying device. A grey-colored diagonal arrow shows the direction of electron flow through the emitter-base junction. This part makes sense, since the electrons are flowing from the N-type emitter to the P-type base: the junction is obviously forward-biased. However, the base-collector junction is another matter entirely. Notice how the grey-colored thick arrow is pointing in the direction of electron flow (upwards) from base to collector. With the base made of P-type material and the collector of N-type material, this direction of electron flow is clearly backwards to the direction normally associated with a PN junction! A normal PN junction wouldn't permit this "backward" direction of flow, at least not without offering significant opposition. However, when the transistor is saturated, there is very little opposition to electrons all the way from emitter to collector, as evidenced by the lamp's illumination! My circuit didn't work, and I was mystified. However useful the "two diode" description of a transistor might be for testing purposes, it doesn't explain how a transistor can behave as a controlled switch. What happens in a transistor is this: the reverse bias of the base-collector junction prevents collector current when the transistor is in cutoff mode (that is, when there is no base current). 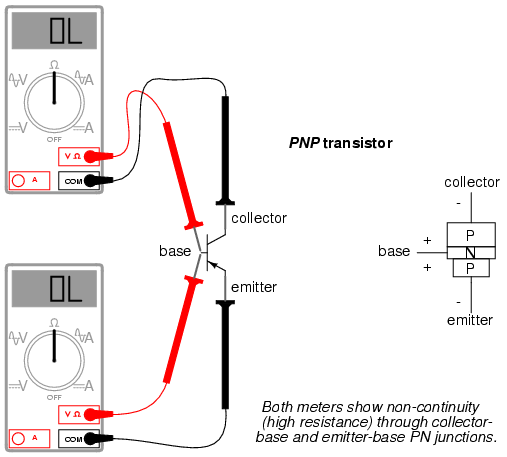 However, when the base-emitter junction is forward biased by the controlling signal, the normally-blocking action of the base-collector junction is overridden and current is permitted through the collector, despite the fact that electrons are going the "wrong way" through that PN junction. This action is dependent on the quantum physics of semiconductor junctions, and can only take place when the two junctions are properly spaced and the doping concentrations of the three layers are properly proportioned. Two diodes wired in series fail to meet these criteria, and so the top diode can never "turn on" when it is reversed biased, no matter how much current goes through the bottom diode in the base wire loop. That doping concentrations play a crucial part in the special abilities of the transistor is further evidenced by the fact that collector and emitter are not interchangeable. If the transistor is merely viewed as two back-to-back PN junctions, or merely as a plain N-P-N or P-N-P sandwich of materials, it may seem as though either end of the transistor could serve as collector or emitter. This, however, is not true. If connected "backwards" in a circuit, a base-collector current will fail to control current between collector and emitter. Despite the fact that both the emitter and collector layers of a bipolar transistor are of the same doping type (either N or P), they are definitely not identical! So, current through the emitter-base junction allows current through the reverse-biased base-collector junction. 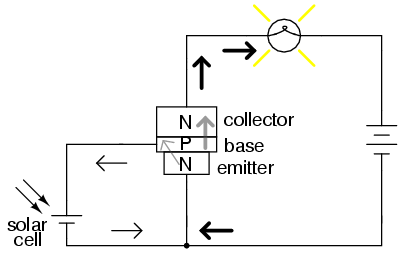 The action of base current can be thought of as "opening a gate" for current through the collector. More specifically, any given amount of emitter-to-base current permits a limited amount of base-to-collector current. For every electron that passes through the emitter-base junction and on through the base wire, there is allowed a certain, restricted number of electrons to pass through the base-collector junction and no more. In the next section, this current-limiting behavior of the transistor will be investigated in more detail. Tested with a multimeter in the "resistance" or "diode check" modes, a transistor behaves like two back-to-back PN (diode) junctions. The emitter-base PN junction has a slightly greater forward voltage drop than the collector-base PN junction, due to more concentrated doping of the emitter semiconductor layer. The reverse-biased base-collector junction normally blocks any current from going through the transistor between emitter and collector. However, that junction begins to conduct if current is drawn through the base wire. Base current can be thought of as "opening a gate" for a certain, limited amount of current through the collector. When a transistor is in the fully-off state (like an open switch), it is said to be cutoff. Conversely, when it is fully conductive between emitter and collector (passing as much current through the collector as the collector power supply and load will allow), it is said to be saturated. These are the two modes of operation explored thus far in using the transistor as a switch. However, bipolar transistors don't have to be restricted to these two extreme modes of operation. As we learned in the previous section, base current "opens a gate" for a limited amount of current through the collector. 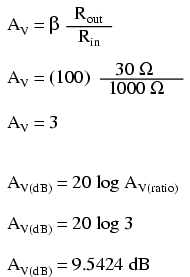 If this limit for the controlled current is greater than zero but less than the maximum allowed by the power supply and load circuit, the transistor will "throttle" the collector current in a mode somewhere between cutoff and saturation. This mode of operation is called the active mode. An automotive analogy for transistor operation is as follows: cutoff is the condition where there is no motive force generated by the mechanical parts of the car to make it move. In cutoff mode, the brake is engaged (zero base current), preventing motion (collector current). Active mode is when the automobile is cruising at a constant, controlled speed (constant, controlled collector current) as dictated by the driver. Saturation is when the automobile is driving up a steep hill that prevents it from going as fast as the driver would wish. In other words, a "saturated" automobile is one where the accelerator pedal is pushed all the way down (base current calling for more collector current than can be provided by the power supply/load circuit). "Q" is the standard letter designation for a transistor in a schematic diagram, just as "R" is for resistor and "C" is for capacitor. In this circuit, we have an NPN transistor powered by a battery (V1) and controlled by current through a current source (I1). A current source is a device that outputs a specific amount of current, generating as much or as little voltage as necessary across its terminals to ensure that exact amount of current through it. Current sources are notoriously difficult to find in nature (unlike voltage sources, which by contrast attempt to maintain a constant voltage, outputting as much or as little current in the fulfillment of that task), but can be simulated with a small collection of electronic components. As we are about to see, transistors themselves tend to mimic the constant-current behavior of a current source in their ability to regulate current at a fixed value. In the SPICE simulation, I'll set the current source at a constant value of 20 µA, then vary the voltage source (V1) over a range of 0 to 2 volts and monitor how much current goes through it. The "dummy" battery (Vammeter) with its output of 0 volts serves merely to provide SPICE with a circuit element for current measurement. Peak voltage measurements of input and output show an input of 1.5 volts and an output of 4.418 volts. 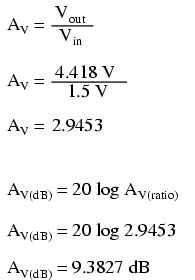 This gives us a voltage gain ratio of 2.9453 (4.418 V / 1.5 V), or 9.3827 dB. As you can see, the predicted results for voltage gain are quite close to the simulated results. With perfectly linear transistor behavior, the two sets of figures would exactly match. SPICE does a reasonable job of accounting for the many "quirks" of bipolar transistor function in its analysis, hence the slight mismatch in voltage gain based on SPICE's output.